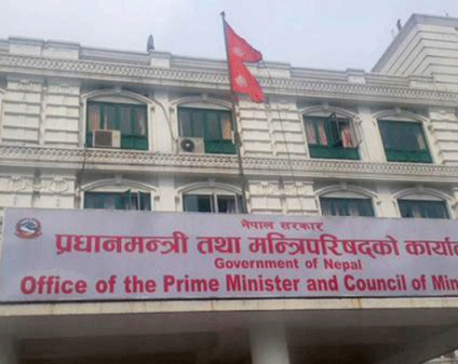 KATHMANDU, Sept 26: Two years after the new constitution came into effect, the government is all set to announce temporary provincial capitals under the new federal setup. The high-powered Federal Administration Restructuring Committee formed by the government has recommended 15 cities out of which the seven provincial capitals will be chosen. 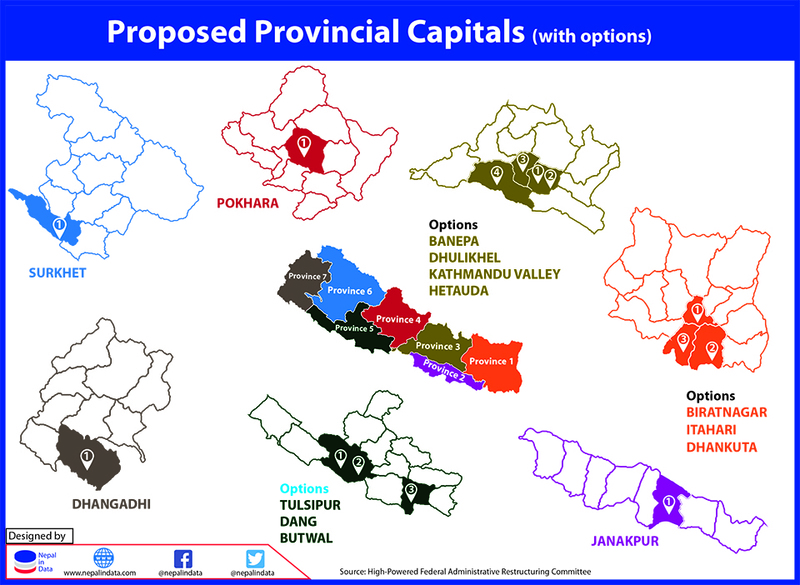 Janakpur, Pokhara and Surket have been recommended as possible provincial capitals for Province 2, 4 and 6 respectively, while two or more options have been suggested for the capitals of the other provinces. Biratnagar, Itahari and Dhankuta have been recommended as choices for the provincial capital of Province 1, Banepa, Dhulikhel, Kathmandu Valley and Hetauda for the capital of Province 3, Tulsipur, Dang and Butwal for 5, and Dhangadhi and Dipayal for 7. “The Federal Administration Committee finalized its recommendation and handed it in to the ministry on Sunday. The next cabinet meeting to be held after the Dashain festival will announce the provincial capitals as per those recommendations,” General Administration Minister Tek Bahadur Basnet told Republica. The committee has suggested six criteria for choosing the provincial capitals, according to a member of the committee. “Physical infrastructure, transport access, administrative access, geographical centrality, historical importance and security are given as the basic criteria for selecting the provincial capitals,” committee member Kashi Raj Dahal told Republica. With the provincial assembly elections fast approaching, the government has been preparing to announce the provincial capitals and appoint the governors of all seven provinces. Article 288 of the new constitution has entrusted the government with the task of announcing temporary provincial capitals. The provincial assembly can change the capital of the respective province by a two-thirds majority. Elections for the provincial assemblies have been scheduled for November 26 and December 7. The committee has also recommended to the government to appoint non-political figures as governors of the provinces. The committee has recommended five criteria for an individual to be eligible for the post of governor. As per the recommendations, an individual with a clean image and renown who is experienced in constitutional, legal and administrative matters and has made a contribution to society can be suitable for the post. Likewise, the candidate should be above 35 years of age, not be a permanent resident of the province in question,and should have the qualifications needed for a member of the federal parliament. According to Article 163 of the constitution, the governor represents the central government in the province and his or her role will be similar to that of the president at the central level. The governor will administer the oath to the chief minister and ministers of the province, call and terminate sessions of the provincial assembly, and approve provincial bills and ordinances, among othe things. Though the government has already announced elections at the provincial and federal levels, the appointments of the governors ae yet to take place. “We will recommend provincial governors to the president for appointment simultaneously after announcing the provincial capitals,” said Minister Basnet. According to the new constitution, the names of the provinces will be decided by a two-third majority of the provincial assembly. Failing to forge consensus on province names, the Constituent Assembly had promulgated the new constitution without finalizing these names.